I am sure many of you (if you are writers anyway) have heard of the Freewrite. Now while I don't have one, I have been watching them for some time. 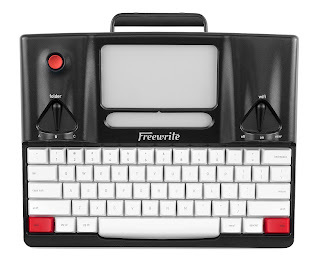 It is (at its core) a portable battery powered type writer keyboard hooked to a Eink screen with Wi-Fi connectivity built in. The idea is if you get distracted too easily, this is the tool for you. Nothing to separate you from your words, and it runs for a week or two on a charge. But then you get into the problems. While it is Wi-Fi enabled, it is ONE way and actually, it is also the only way since you can't transfer files via USB (yet anyway, although it was touted as an original feature). And when you do export your work, you can't reimport it back in. You also can't do italics, bold or such as the files are only plain text. You would think for a $500 price tag they would allow reimporting and use rich text formating (RTF) that can use bold/italics. Another problem is the lack of visioning. It is easy to get confused which file is the newest one if you have sent to several places. And you can't edit the file name without erasing every word in the file, further complicating the issue. It may even be part of their premise to only look forward and never back. Well I don't know about you, but if I don't know where I have been, I also can't tell where I am going either. For a lot less than $500, go get the cheapest laptop you can find and load it with FocusWriter and yWriter. Both are free (but do accept donations). Also both have a option to go full screen being a distraction free environment. They also both have typewriter sounds if you want, and functionality that blows the pants off of Freewrite. I use both programs a lot, especially yWriter. Scrivener is another great piece of writing software, and while not free it also has a "full screen" mode for those that get distracted too easily. All three programs use RTF, or will export to different formats. But almost anything can read RTF. And all three can import back in as well. I also came across someone comparing the Freewrite to a Alphasmart Neo. While I haven't used the actual model, I have used something similar in years past. And while it has a smaller, less capable display it also blows away the Freewrite in functionality. Personally, my similar word processor of choice is a Apple eMate 300. It is a lot more flexible than a Alphasmart Neo with its touch display, better software, and storage capacity. The battery life is also weeks at a time. The downside though is batteries for it these days are so old you have to rebuild the pack or use the AC adapter. And to connect the device to a USB port requires a copy of windows 98 in a virtual machine like VirtualPC. There are other ways of course, but that is the most efficient way I have found. At least via a cable, the other way is with Wi-Fi where you can email something to yourself. But the kicker is here, you can also transfer it back the same way. One trick that leaves the Freewrite scratching its head. And this from a device that hasn't been supported since 1998. Don't get me wrong the Freewrite is a great idea, but they certainly didn't go far enough. And with all of the development, a couple of more features would have made all the difference in the world. Right now I would call it a $500 dust collector. Granted, they may add what is missing, after all the firmware on the unit is upgradeable, and things may change. But it should have such basic abilities out of the box. Especially for something designed for writers. Writers, by nature, are all about getting the words out in the easiest way possible. A good tool does not get in your way, it gets out of your way and lets you get the work done. If the tool gets in the way, then it is time to find another tool. Red Warp is out in print June 24th!